Home Oral Health & Hygiene Can a Sinus Infection Be Caused by a Tooth? There are a few different sinuses located in the facial area — around the cheeks, nose, and above the eyes. 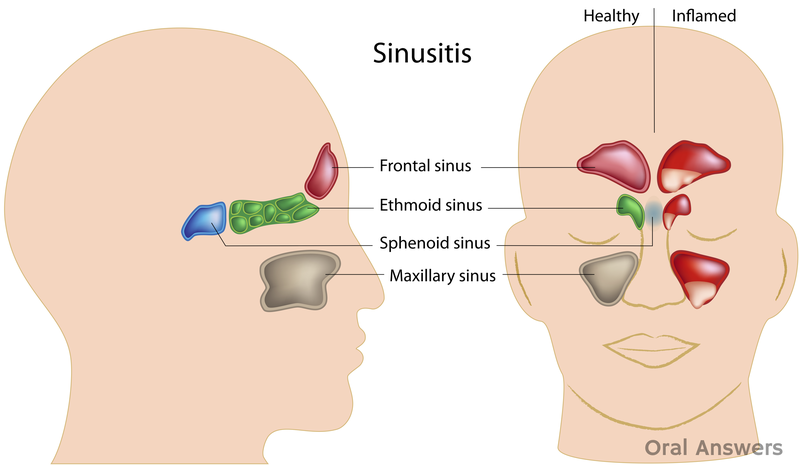 The diagram below gives you a little better idea of where the sinuses are, and how they look when they are healthy, versus how they look when they are infected. If you look at the diagram above and imagine a row of upper teeth, you can see how the roots of the upper teeth come into close contact with those sinuses on each side of the nose. These sinuses are known as the maxillary sinuses. While there are several sets of sinuses, the maxillary sinuses are the only sinuses that can also be infected by a tooth-related problem. Below, you’ll find a couple of examples of how tooth infections or abscesses can cause sinus infections. 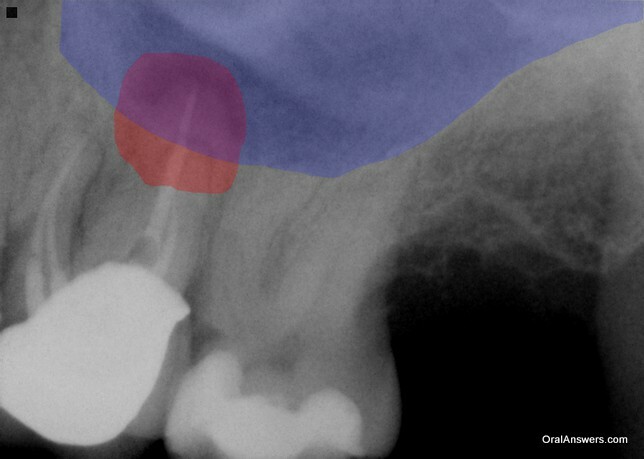 Here is an x-ray of a tooth that had a root canal and crown done previously, but the infection at the roots had never quite healed. I have outlined some of the important structures below for those of you who are not accustomed to reading x-rays. As you can imagine, the infection and the sinuses do overlap, as you can see in the x-ray below. Although it looks like the sinus and the infection are overlapped on the x-ray, it doesn’t necessarily mean that the infection has broken into the sinus and causing a sinus infection. It could be that the abscess is either in front of or behind the sinus in this x-ray, because the x-ray is simply a snapshot of the whole area and doesn’t tell us if things are closer to the front or the back. If you take a look at the x-ray above, you can see how close the maxillary sinus is to the upper teeth. Sometimes there is only a thin membrane separating the roots of the upper teeth and the sinus, making it very easy for an infection to travel into the sinuses. Although this person wasn’t exhibiting any symptoms of a sinus infection, but the x-rays do a good job of showing just how close the abscess is to the sinus. This person had chronic sinusitis for the last few years, that started shortly after she had a metal post put into one of her upper back teeth. Upon looking at her x-rays I noticed that the metal post that was put in one of her upper teeth looked like it had pierced through edge of the tooth and gone slightly into the bone. This caused an abscess that was leaking into her sinus. Sadly, due to the fracture in the tooth caused by the large metal post, the tooth had to be extracted. The oral surgeon who extracted the tooth told me that the tip of the tooth broke off just above the metal post, causing the root fragment to get pushed into the sinuses during extraction. He had to open up the sinus to retrieve the root and he was able to suction out a lot of the infection — he said it was a pretty bad infection. While sinus infections can cause teeth to to hurt, hopefully this post has helped you see that infections from the upper back teeth can easily make their way into the sinuses and cause sinus infections. Do you have any questions, concerns, or comments? Feel free to leave a comment in the comments section below. Thanks for reading! Im glad i read this article. I didnt know how close the maxillary sinus are to the teeth. I am in a great deal of pain. My ear nose tounge head and upper left teeth hurt. I went to a family doctor and she told me that everything was altight and i had probably sinus and it was nothing she can do. She told me to take some ibuprofen for the pain, and over the counter medicine. Im still in pain and after reading this article i decided to call my dentist. Last year i was experiencing a similar pain, and i have a root canal in one of my left teeth. I can not believe this may happen again in the same side . I was hopping it was just a sinus problem, i dont know why my nerves are dying since i take good care of my tooth…..
Glad it helped, Irene. There is a possibility that there is some residual infection around the tooth with the root canal, and that could cause sinus issues as well. I hope your dentist can pinpoint the problem for you – Have a great day! I have a question also I had a filling done on my bottom tooth an since that I been getting massive pain in my bottom right side of my jaw and the pain is leading up to my ear what should I do, The pain is leaving me with sleepless nights?? I have just gone through same thing for the last year dentist told me was not possible doctor took a long time to refer me I have since had ct scan and same thing root canal has gone through to sinus, good news I new what problem was bad news infection been going on so long now it has spread to all my 4 sinuses and in cheek bone need op asap but need to find dentist willing to fix the tooth as tooth and gums still very healthy.. I had a crown put on root canal. I’ve got foul smell and sinus drainage on one side (where tooth/gum is infected). The smell and taste are driving me crazy. I was put on antibiotic two days ago, but no relief. Dentist won’t be in until Monday. Good grief. I need relief. Hi, did you find relief? I just had a re-root canal. 3 days after the re-root canal, I have the foul smell, drainage and severe pain in my nostril just above the same tooth. I feel like I’m going crazy with this smell. I’ve been on antibiotics for 5 days with no relief. What I read, the putrid smell is caused by anaerobic bacteria and all antibiotics do not treat them. This smell is one of the two typical caharcteristics suggesting dental-based sinusitis (the other being one-sided infection). These infections are nearly always caused by anaerobic bacteria (although there may be aerobic bacteria, too). Therefore, it is important to have an antibiotic which treats both kinds. I myself went finally into sinus puncture and aspiration. It was horrible, but the awful smell/taste disappeared! It is supposed that removing the pus helps the antibiotics to kill bacteria more effectively + makes the environment less friendly for anaerobics. Now I just wish it didn’t make anything else worse. Namely, the dental feeling pain (inside the left upper jaw bone) came back. Or maybe I am now able to feel it again when the sinus pressure has gone? I still have antibiotic treatment, but only AmoxCla which I wouldn’t trust so much. So, the sinus puncture may help, but consider it carefully, discuss with experts and try to find a really experienced doctor to make it. Yes you should go see a holistic or biological dentist. They are the best to go to for these things. They completely know how teeth can become toxic to your whole system. Look up Toxic Teeth. Please.. I was diagnosed w a sinus infection back in Dec 2016, went through (3) different antibiotics, finally referred to an ENT who had a CT scan done, looked like possible dental issue causing chronic sinusitis. Had oral surgeon evaluate & he confirmed that there was dental material that had perforated into my maxillary sinus from a root canal I had done in Aug. 2016. I’ve never had a sinus infection in my who life (I’m 45)…needless to say I had the root canal tooth pulled as it was rotting at the apex, had the “hole” into my sinus sutured up. Had sinus surgery the other day, went for followup w ENT & he informed me that they found amalgam(filling material) & other tooth material in my sinus. The oral surgeon & ENT have both confirmed that the dentist is responsible for this, dentist is denying any wrong doing! The bacteria in my sinus is so “strange” that I will be on another antibiotic after my system is given a break for one week…this has been a nightmare! I have had what can only be described as the bog of eternal stench from the movie Labyrinth in my sinuses and nose for about a year and a half. The taste, smell and post nasal drainage is absolutely unbearable and now pouring out all of my upper gums. Told my GP and he gave me antibiotics which seemed to make it worse. When they didn’t work he said it was a bacterial sinus infection I would have to deal with forever. I said excuse me, bacterial infection forever?! WTF?!! A CT Scan shows It has now spread to my sphenoid sinus and is causing UNBEARABLE pain in the back of my skull and neck that radiates into my eye. I went to my (Medicaid) dentist because through web research I found out is more than likely from a tooth broken off at the gum line that let bacteria into my sinuses but he did absolutely nothing. By the way my GP is a Medicaid doctor as well, I guess with Medicaid they consider you a useless member of society not worth the effort. Well my dentist only cared about doing 2 fillings and said that the cause of my sinus infection was more than likely from that bad Maxillary molar but did not care to give me stronger antibiotics. He submitted an surgical extraction claim to Medicaid which they denied and said it wasn’t medically necessary. Now I am having horrible fevers, night sweats and the smell of death in my sinuses. They wouldn’t even refer me to an ENT. In order for Medicaid to pay there has to be a referral which my GP could careless about giving. So I guess I’m Screwed. I hope you had better luck than I. If you are having trouble with your stomach, I would take Mesosilver, It’s the best colloidal silver I have found, and it does not irritate the stomach. Do the research online as to the dosage, some people say it doesn’t work or it turns you blue, Mesosilver does not do that, read the science behind it on the Mesosilver site. I know it works, cause I’ve used it. Hi Tom, so I’ve just found out I have a massive abscess above my front left tooth and I’ve been having extreme nasal problems lately to where I can’t even touch my nose it’s excruciating! The tooth has previously had a root canal and crown put on it about 5 years ago, what is the best way to treat this? As it is my front tooth and I’m simply terrified to have no front tooth! I just read your blog. I have the same thing with my front tooth and has to come out. What did you do? Please let me know. I am very confused and anxious. I just had my teeth extracted and will eventually have implants with my dentures. It’s been a week now and my nose stopped running and I can breathe at especially at night. I am so glad I got this done. I feel so much better. Tom you are right about the root canal tooth thingy , It started 7years ago when I had got my first root canal in one of my front tooth then a few months later I got a sinus infection but this infection went on for weeks had antibiotics it cleared up for roughly 3 weeks , then what do you know I felt unwell went to the doctors they said I had a sinus infection and this continued for another 2 years back and forward to the doctors believing I had a sinus infection. Then one day this abscess was so big it was covering 3 of my front teeth and all up the inside of the left side nose. I then went the dentist and thy told me I need a root canal on another 2 teeth things came right for a short time …cut the story short over a few month it continued like this until I had 4 of my front teeth that had root canals…… Now this is where it get interesting and could prove your story, for 3years I would get sinus infections but as the years went on they got worse, until one year my root canal teeth started going black I wanted them removed as it looked really ugly the dentist said we could bleach them if you like but it would take a couple of visits very expensive$$$ they tried every way possible to change my mind. I then went to a denture place to see how much it was going to cost for the 4 teeth to be pulled and a plate made ( part dentures) I was sent back to my dentist 🙁 my dentist were up set that I had gone some where else… wow they then agreed for me to have them pulled but that was after I had X-rays and found I had another abscess?? Tom I had an infected tooth pulled on the upper left tooth iam having I have problems with the left sinus and am having mucus come down from the top of the back of the throat but only on the left what tablet can I use to clear it up or do I need a scan ive been telling my doctor but he says its nothing but iam sick of chucking up in the toilet ? CAN ANYONE TELL ME WHICH TEETH NUMBERS BORDER THE FLOOR OF THE MAXILLA SINUS? Had an nfection up by my sinus area that showed up in a dental x-ray about 3 years ago. It, according to my regular dentist, was caused by a bad tooth (upper right molar). This dentist upon seeing my x-rays told me he couldn’t help me, that I had to go to an endodontist for this problem and recommended some. The reason the reg dentist told me he couldn’t help me was because of the infection being too close to the sinus area. After being scared to death from hearing what the regular dentist said, I hesitated (the cost and lack of insurance were considerations, plus some other issues) but had noticed this particular tooth was a bit loose for quite a while. though it didn’t cause me any real problem yet. In the meantime, not knowing what to do, remembered that some friends of mine liked using MSM for their teeth. Then I read in a book about uses for MSM that a woman had gotten rid of her infection up by her sinus area by using MSM so then opted to try that instead. Took a Lot of the powder form MSM (this can be purchased at a health food store) dissolved in water by drinking it down (yuckiest/most bitter stuff! ), plus would also do my teeth really well with MSM being used in a water pik. Did the drinking of the MSM/water mixture for several days. then stopped. But did the MSM in the water pik for around 3-4 weeks faithfully. Doing the MSM in the water pik seemed to hold me over so that I at least didn’t have to take an antibiotic while we were away for a couple of weeks, which had been one of my biggest fears — that this tooth area would flare up and cause a lot of pain and we’d be out of state at the time. In November when we got back from our trip, I started wiggling this tooth a lot– it was a bad habit, but it was actually getting this problem tooth to the point of coming out with little effort (and very little blood, which was surprised about). That’s interesting. I always try more natural remedies before anything. I’ll look into it further. I have similar issues, my dentist said teeth grinding may be the cause of all our needed root canals! I’m a retired dentist so I have considerable background. I use a CPAP machine and my dentist wanted to make sure that my nasal cavities were patent so that I could wear a bite appliance instead of the CPAP. My dentist took a routine panorex and found an abcessed tooth very close to the floor of the sinus. Even though I had a bad odor in my nose for several months I didn’t connect the two since I was not having any tooth pain. I’ve seen my ENT doctor and had the tooth removed 10 weeks ago. I am now on my second round of antibiotics after augmentin failed to address the problem and have now been on Cipro for 8 days on a 10 day regimen (klebsiella found at laboratory) but the odor is still there so I’m assuming that the sinus infection has not cleared up. Do we try another antibiotic or have non-invasive sinus surgery? I have been battling allergies late this season due to our late spring season this year. My sinuses started hurting over a week ago.. first the right side and now the left.. the left side is worse and I have a lime green thick mucus that is hard to discharge. Yesterday I had some mild pain in my back upper teeth especially in the eye tooth. Today it is unbearable so I have started amoxicillin and am looking for some home remedies for the tooth pain… it is worse than any abscess or cavity I have ever experienced!!.. any suggestions??.. I cannot touch them together and any talking, eating is just plain unbearable. Thank you for any tips you may have. Like stated sometimes it is very difficult to ascertain whether the abscess is really into the sinus. Thats why everyone needs a 3D tomo, In this day and age, they are just so cost prohibitive. As always the pricing over the years should come down. And of course we get a lot of false alarms too, where we have molars with no fillings with no signs of fractures and they say that their teeth are throbbing. Usual signs they say are that their teeth feel taller or sensitive to bite. And it only takes radiographic evaluation to realize that the sinuses are draped over the molar and premolar roots and they are congested. I have had a problem with my sinuses ever since I had my teeth cleaned in Feb of this year. I have had pain in it ever since they drilled in it and whenever I drink cold or warm stuff the sensitivity is horrible. I think it is a teeth problem probably a sinus tooth infection and Im going to a dentist to maybe get a root canal in it because I cannot stand the pain anymore and the pain infects my ear and my other teeth. I have had this problem for over 4 months now and I cant stand it anymore. I had a really bad tooth infection in 2012 in one of my molars and a doctor tried to tell me it was a really bad sinus infection but this tooth caused me so much pain that my dentist said it could have killed me because my tooth had a hole inside of it and he said that I started developing bad swelling in my cheek. So I had to have my tooth removed and thank God I did. But before I had the tooth removed the doctor that I saw gave me amoxicillan so at least that helped my swelling but very little until I had my tooth removed. I hope I don’t have to have my front tooth removed I hope I can get a root canal done instead. I’d just rather get dentures if I could do anything then maybe I wouldn’t have these sinus problems? Because usually when I get sinus or allergy problems its just from the summer or winter because of the seasonal allergy problems but nothing like I have had this year. I had a tooth removed in the upper right. The tooth had broken and had become very irritating so I decided to get it removed and OMG my ear my right side of my face and the right side of my nose swell. It hurt the whole weekend I went back to the dentist had sinus infection caused by that tooth now taking antibiotics amoxicillin still feel bad but getting alittle relief. I have same issue, hurts. Thanks for good explanation Merilyn, I will call dentist in the morning. I have had a terrible case of maxillary sinusitis it started the last Sunday in june 2015! It is now July 30 I’m in so much pain,I went to the dentist for a cleaning and x-rays in July of 2014 and was told I had 10 cavities! I was at a pain level of 8 then I got one of my teeth filled and it dropped to a 5 but 3 weeks later I’m still in pain I’ve been through a Zpac and a 10 day course of augmented with prednisone that helped alot but I’m still having problems do you all think getting other 9 cavities filled will help relive this horrible pain? Andrea, did you get rid of your sinus infection? Bacteria in your mouth can buildup and eventually cause a tooth infection,which in turn may spread to the sinus. The first maxillary molar,s one of the largest and strongest teeth in the upper jaw is usually the culprit because of its proximity to the maxillary sinus.The mucus must move upwards to drain from the sinus into the nose,which does not happen when standing up and thus the sinus gets infected more frequently than the other air cavities. Can a sinus infection cause pain in your lower jaw? I have swelling in my lower left jaw and pain in my left ear. I went to the doctor and was told that I do not have an ear infection. Hi, I have a problem with one of my teeth that has had a root canal done then crowned then the root canal redone by a specialist then recrowned. The tooth is on the right upper and forth from the back. The problem seems to occur when I get a cold, with pressure build up and a bad smell coming from around the top of the crown. My dentist tells me to rinse wth salt and hot water but it comes back. Any ideas? No, it’s not common that crowns cause bad odor. A single crown should not. But *clumsily made* crowns cause odor if they are designed as food traps. ‘Flossability’ needs to be tested before permanently cementing a crown. Do hyper-busy dentists have the time for that? I hope so. Dental bridges, however, if not taken care of extremely well, commonly cause bad breath. In this case, your waterpik suggestion makes sense. Use all you have in your hygiene-arsenal if you have a bridge (or a crown that traps food) – special floss-holders for bridge wearers, waterpik, mouthwash, thin-bristled toothbrush! One word to mouthwash: use NON-ALCOHOLIC ones (better for your gum health) & rotate through a few brands – bacteria will get used / resistant to one type after a few weeks. 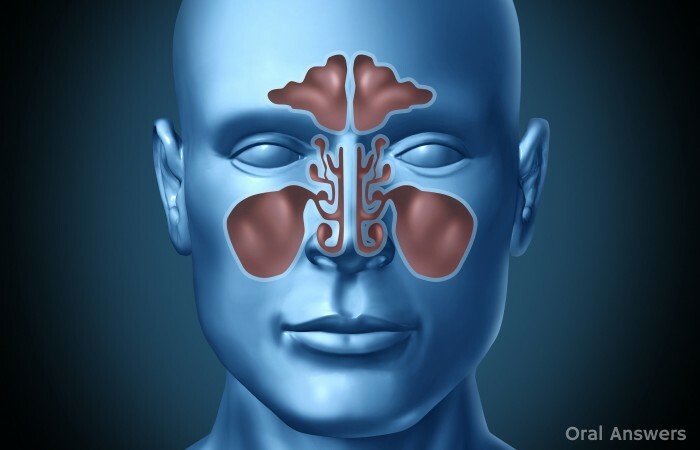 I help…..I have been dealing with what I thought was a chronic sinuses infection for 5 yrs. Antiobotic after antiobotic which clears it up and it’s back within a week…This infection is only on one side and is above a tooth with a crown…the crown is 14 yrs old and the dentist says it’s leaking and he could see where bacteria has gotten to the bone…the dentist also said he don’t think it would cause a sinuse infection which makes me wonder if it really is sinuses or an infection in the root canaled tooth . He wants to do a 2nd root canal and put medicine in and leave it for 2 weeks..I’m wondering should I get it pulled? I first noticed what I call a blood blister while riding in a pick-up. It broke after holding a cell phone against my cheek and hitting a bump causing it to pop. A few days later I noticed it was back. It is very high on my gums – just below my cheek bone. A month later it was still there and was time for the dentist visit to get my teeth cleaned. It turned out to be above a tooth that needed root canal. He said they 2 were connected. I had the root canal and expected the blood blister to disappear but it did not. Today he cut it off calling it a “sinus tag”. Do you think it will return? What is going on? Also, I am not and never have had any pain thru all of this. I have very bad teeth. almost all of my teeth have bad cavities. a few of them are black and rotted down to almost the root. I have been recently diagnosed with chronic sinusitis. I have not been able to smell at all for over 8 years now. can that be caused by my teeth since they are so bad? Yes, Snap On teeth are an inexpensive option (compared to others) and will cover the holes left in your mouth from the removed teeth. can orthodontics work cause a sinus infection? I am currently having orthodontics work done to spread my top teeth apart to make them fit better to my bottom teeth,and I am having sinus issues that I have not had before. I had 7 upper teeth removed last November, one was the last molar on the right upper side. Six months after having the teeth pulled I went back to the dentist because i was having problems with my sinuses. The x-ray showed something close to the sinus. I went to a EMT doctor who had a CT scan done and that showed a tooth fragment had been left behind. I have had two sinus surgeries because of the infection that this has caused. . Another surgery is possible, I have been told that a tooth fragment is different then a tooth root and that this fragment is more then likely the cause of all of this. Can a tooth fragment cause such a huge problem? I suspect I have a similar problem. Had root absorption 15 years ago and we (dentist and periodontist) have been babying the tooth knowing that it will have to come out someday. The tooth is some times loose, some times not. But I had a periodontist cleaning last week and from my eye to ear and upper left area where the bad tooth is (including forehead) is numb and some pain. I have antibotics on hand and it seems to help. There are no easly solutions for an implant since I need a sinus lift. I am lucky to have had this tooth this long. But I suppose it has to go. Hi, I have been doing some research on this topic, and have a question for the dentist. I have what looks like an abscess on my, counting from the top left front tooth 4 over (sorry not good with dental language), at the crease of my upper lip and gum line. Went to the dentist, January 5, to get an antibiotic to get this cleared up. I was told my teeth look good, because I have had root canal treatments on this tooth and it has a crown (which fell off the prior Saturday, but was replaced Monday). I was told I have a sinus infection, but all articles are stating the back molars. Also I have been on medicine since Monday, Cephalexin 500 3x a day for 10 days. The abscess has not went away or has not improved at all. Should I see a regular doctor? My dentist is old school and really doesn’t explain much. Curious to the outcome of your issue if you dont mind sharing? Will a cavity with sinus infection clear itself up after some time. I used to get severe pain on this sphenoid sinus area periodically. I had a decayed tooth on the left side which I noticed late. Last week I did a tooth coloured restoration for the cavity on my left tooth from clearbrook dental in Oshawa. This also brought down the pain I used to get. Is there any relation between cavity and sinus? I have a had root canel twice on this tooth with a crown finally . Last year about this time ..it started bothering me again with painful on that specific tooth,.i t came and went for a month at which time I was back in Canada,,X-rays were taken but one of my lowers was in née of a root canal and could be causing the referred pan.. Happillily thr problem seem remedied,,however the problem has risen again. 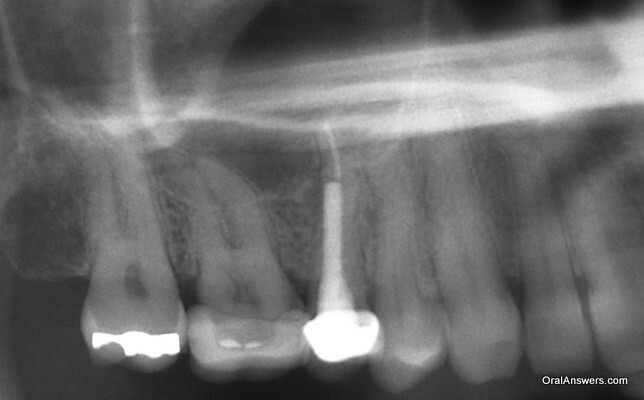 Very painful on the original upper right crown with root canal ..now what??? I need realy help. When I was 14 I lost three of my last molars top left side because an infection in a one and a bad bridge work. 15 years later appeared a piece of bone in the palate inside through the skin that the oral surgeon had to take by surgery. After another 18 years I decide d that I needed implants for those three molars . I’m damage my right side and I don’t have to good teeth. My oral surgeon did all his job lift my sinus let them heal, put the first step the screws but the one near my first tooth got infected realy bad and he took it. After one year he put it back on and the pain started agin realy bad like was infected but no it was a not visible perforation that went to my sinus not know due to another infection or the screws but in the X-ray didn’t show perforated only when he sprayed to clean I passed out due to the pain and blood and fluid were coming out my nose . We wait another 6 months and now he did some plasma fibrin insertion ( the other 2 screws are fine) after one week he took off the stitches one didn’t closed well and then sin started again after 12 days , he put another stich and tells me that seams my bridle is near the muscle and the nerve and he will have to cut it internally in 4 months when he will try to put again for third time the screw for the future implant. I’m very scared the pain still there Percocet doesn’t make this pain at all better. I have chronic sinus infection since very very young girl(7 years old) now I’m 50 and I don’t know what to expect can you help me? Hi everyone. Having read this article makes me think that I might have a sinus infection. I can taste some bad smelling stuff coming out from my upper-left. Gives me bad breath, but I have no pain. I went to my dentist and asked him to take x-rays of that area to see what causes this, he said there is nothing there. Bear in mind, I have root canal done on one of my upper-left teeth. I don’t know whether its a bad root canal treatment (had it done a long time ago) or sinus infection. Is it possible to treat the sinus infection without surgery? hi im indian has came au in Nov.2014.-Before coming to australia I had a part dental fixure (failed)which were removed a few days earler to visit au. However my uper last molr start bleeding ocasionaly or when I press it it release pus type blood.After cominng to au I started nalal as well as cough mucus contineously.3 months has elapsed no relief inspite of amoxil 1000 mg.I have headache nasal congession phelgem without stop head sinus congession.It does not effect at sleeping time.Ultimately returning india.Any suggession pl. For the last 3.5 years I have been suffering from a combination of sinus type discomfort and disgusting drainage down the back of my throat. This happens in relation to a terrible sensation of pressure on the left side of my face. When it gets bad, it seems to spread across a nerve that forces my forehead muscles to construct into a furrow that I cannot relax. I have had a lot of dental problems. As a person with horrible teeth and many treatments and extractions, I am familiar with the taste of an infected or decaying tooth. This is what drains down the back of my throat. I have had 3 ct scans of my sinus by 3 different ENTs. They all conclude my sinus looks fine. 10 years ago tooth 12 and 13 were treated with a root canal. The #12 tooth was badly decayed and I was warned that her repair may have only given me a few extra years. Neither tooth was crowned immediately but they were built up. 13 has 1 post & 12 has 2 posts. 7 years later both teeth lost their fillings and I went a year before returning to have them looked at. I had already lost teeth 4&5 from chewing on them after the fillings broke off & I assumed these teeth would need to be pulled. As well. My dentist told me they were ok and we could crown them. During the preperation I complained about the pressure and bad taste. He discovered via xray that I needed 12 and 10 retreated by an endodontist. That same week #14 was discovered to be calcified and needed to be treated by an endo as well. Unable to afford a licensed endodontist I went to USC to see a student. #10 was later discovered to be damaged from the re treatment at USC (likely very difficult removal of post) and was later pulled. #14 was treated last year. But now has it’s own pressure sensation. (Separate from the nagging one I’ve had for 3+ years, this one is further back on my face) my primary dentist tells me both teeth look ok. Out of frustration and with the taste of decay in my mouth and draining from my sinus down my throat, also #14 making my floss stinky, I paid for a full set of X-rays (required by USC Orofacial pain clinic.) I was told that #14 has a lesion. They said something about it likely to have occurred after my root canal because it was calcified. They wanted me to be seen by another endodontist. They also said #12 shows signs if inflammation. They said the nerve may have been damaged and even if I pull the teeth I may still feel the horrible intense pressure & facial tension. They also want #12 looked at. Last time it was treated they had to go through the gum. They were afraid the posts removal with such little tooth structure could crack it. I believe strongly I have an active infection. My left gland in my neck is always aching and that taste!!! I know what a bad tooth tastes like!! My symptoms feel better but never go away after antibiotic treatment. I started buying antibiotics on line just to control my own symptoms. I recently (3months) ago stopped because I was afraid that taking them was keeping my infection from showing up on X-rays. Now tooth 12 is feeling a bit loose. I’m so frustrated. I feel like my primary dentist doesn’t believe me. I asked him to just pull it but he doesn’t want to pull a tooth if appears to him to be ok. I’m not crazy. I believe my tooth is rotting and it’s draining into my sinus, then runs down my throat. Sometimes if I get a good glob of it, the pressure feeling goes down a few days. I have to sleep with gum in my mouth so I don’t have to taste it when I wake up. (That’s when the taste & pressure is the strongest.) what can I do??? I read your post and I’m wondering if your dental and sinus problems are now ok. I may be having the same issues. My upper right tooth # was cracked, but I did not know it. I went to the Endodontist to have a root canal but was put on antibiotic for approx. 1 week. ( Ciprofloxacin x 7 days. He stated I had a bone infection and abscess that had reached the sinus. I went to a local dentist after the root canal to have my crown repaired on that tooth. The dentist stated that I had an infection that would need antibiotics . I started Augmentin x 2 weeks. The abscess filled back up in approx. 2 weeks after the second round of antibiotics. I went to an oral surgeon to have the tooth extracted and was placed on another antibiotic/Clindamycin for a week. My septum was badly deviated and the ENT could not get into the right sinus to clean out the infection, so I consequently had a septoplasty He placed the windows in the sinuses and reduction of turbinates. The sinuses were washed out and I was placed on antibiotics again for 7 days. I was placed on Cephalexin for 7 days post op. A culture was never done. the infection is back ( abscess full) with green drainage. I have irrigated and irrigated to wash it out. GEt the TOOTH REMOVED!! get a CBCT scan ( cone beam ) 3d and get that tooth that’s causing problems out! Interesting thanks for sharing. I went to my dentist around November 2014 and he commented that my right upper rear tooth that we had done a root canal and a crown back in 2007 was loose. I had noticed some occasional pain from this tooth but it would come and go. Sometime in December ’14 I got a cold and I had one of the worst sinus infections I can remember and it lasted about 6 weeks. I had never had one to last this long before. Well the tooth pain became more consistent and he recommended removal but I got another sinus infection in May ’15, he gave me antibiotics to get rid of it before extracting the tooth. So I took them and the sinus infection cleared up about 3-4 days afterwards I went in to have the tooth removed, it came out in several pieces and he said there was a lot of bacteria in the tooth and it had split under the crown. Two days after the tooth was pulled my sinus infection is back lots of green coming out of my nose and the taste in my mouth is horrible. I don’t want to blow my nose because that’s not recommend with the tooth just being removed, and when I do I get a really bad taste in my mouth. He just called me in more antibiotics today, hopefully the bacteria in the tooth is all that caused this to happen and this round of antibiotics will be the end of it. I will post back with updates, good luck to all. What ever happened with the infection did it come back>? I had a sinus rupture while flying- just before landing. Could this be any connection or would it just be from the pressure change as we were descending? I have recently gone through a very similar scenarios. Mild headaches for over five weeks every day. Went to my dentist three times. The first two times he worked on my bite. The third time he found a possible problem with my back left molar. Sent me to an oral surgeon for a 3-D panoramic x-ray where he found the sinus above this tooth totally blocked. The tooth already had a crown and so the surgeon felt it needed to come out. He started me immediately on AMOX-CLAV for 10 days. Tooth extracted on the 5th day of meds. Everything went well. Six days after I finished the antibiotic I came down with a “cold”. Now it’s the 4th day of the cold and I have a loose cough with yellow phlegm. Is this still drainage from the sinus? Yes dear a sinus infection can be caused by a bad tooth. Let me share my experience. 13 years ago i did a root canal. After 7 years it got infected. The dentist said it was leaking and did over the root canal. 2 years after that the tooth began to hurt again causing pain up my nose and face area. I was giving antibiotics. Over the last five years i noticed that i had heavy mucus buildup, sinusitis, breathing problems and the doctors seems confused as to what was happening. My eyes also became infected and was loosing sight. About two weeks ago after my routine cleaning the dentist notice that their was a sac over the root canal tooth. I was surprised how much blood was ozing from this sac. The dentist told me that it was the infection coming out on my gum. After reading forums like these and realising that That so many people are getting the same symptoms and only to realize that the one common factor we all have is ROOT CANAL. I immediately ran and took the teeth out. Due to heavy mucus buildup up and chest congestion i develop breathing problems. Glad to read this lecture on sinus involvement. Two months ago I had a root canal on tooth 27 (bottom, towards the front). After battling a difficult bronchitis for 3-4 weeks, the root canal suddenly exploded with pain (practically overnight), with enormous pain and fever. Emergency dentist visit revealed a serious infection in the lower jaw, and I was prescribed stat antibiotics and a fast visit to an endodontist. The endo opened up the canal, drained and scaled back on the antibiotics, but kept a third of the dose. Two days later it was worse–and the swelling spread to the upper part of my mouth, including the roof. Question: this article talks about upper dental problems, but is it possible that a severe infection of the lower jaw could spread to the sinuses? I now have crackling in my ears, general congestion, mucus production and slightly less hearing. Note: I have been on higher doses of antibiotics, now including Flagyl, which seems to be working just fine. But could this be causing the sinus inflammation response even if the source is in the lower teeth? Thank you! Hi leigh. Am not a dentis but from my experience and what i was told by my dentist is that any kind of tooth infection could spread as far as your blood stream and cause trouble. You said the swelling spread to the upper jaw hmm. Monitor the situation and keep your dentist posted like i did. Good that you mentioned the ear problem. A friend of mine told me that before she remove her root canal tooth she had ringing in her ear for months immediately after the tooth was removedit stop. Also a friend of hers ear drum burst with a tooth infection. Thank you. Yes, indeed, I had a confluence of a root-canal gone awry and a sinus infection. That all affected my Eustachian tube. I was treated with very strong antibiotics (Metronadizole and Clindamycin) for 3 weeks. Also, an Endodentist opened up the root canal and discovered there was indeed some root and nerve left at the base. All was treated permanently and the swelling, pain and fevers have subsided. Whew–that was complicated! Your point about the bloodstream is a good one. Thus, I was put on very high doses of antibiotics for an extended period of time (500mg Metronadizole, 600mg Clinamycin) which knocked that down. One has to be persistent and go to several doctors if necessary. Leigh, are you better now? I had the same thing and it was two teeth that caused the sinus infection. I had them both removed. The last on was a week ago. I still have some swelling in my neck and still feel like I have a sinus infection. I am also on antibiotics. Does this take a while to clear up? My nose and post nasal still have thick mucus and under my eyes are puffy. My eyes are burning also. I feel like I am not getting better! I have been battling this for 8 months now. I am really in a funk. What do you do when your dentist cannot find anything wrong with your teeth and your doctor is only treating you with antibiotics for sinusitis that doesn’t seem to be improving? I had a CAT scan and they said it was sinusitis. I don’t seem to be improving but the pain is along my right upper rear teeth towards the tip of the roots. In my opinion (and I’m not a doctor), see an ENT. It is very possible that sinusitis can cause that pain, but you may need more aggressive treatment. Having persistent sinusitis can become dangerous (in the brain area) if it is not corrected. Perhaps your MD needs to culture your sinus to find the right antibiotic, so that can be knocked down. As for the dental issues, you may get a consult from another dentist. However dental infections–when they have gone awry–are pretty symptomatic with local swelling, redness and excruciating pain–and a horrible pain if you bite down because the gasses near the bone expand and you feel that your teeth are higher somehow. Sorry you’re having such a tough time! I’d like to know if it is likely that the sinus issue will resolve once the tooth is extracted/or an apico is done? Could a tooth that has been loose due to sinusitis be tightened down again? Or is it something that I will have to live with, will I have to get the tooth extracted or will it be OK? Because a tooth of mine,which was crumbling, had to be removed for that reason. I fear that the dentist may have disturbed the tooth next to it. Then again I am very sensitive to allergens. I don’t know what is going on or what to do. And I do have sinusitis right now and that’s when I noticed it was loose, only the effects from it have been enhanced now and I feel them more and it doesn’t seem like it can be tight again. Can you please help with the situation? Did they see the abscesses on a ct scan? Did you have pain in the teeth? Also, how did they determine that is has spread along your jaw? Nice article but I am quite worried. I have basically not been to a dentist in 30 years (at the time, I had about 4 root canals done and a few cavities filled – I was about 18 or 19). About 6 months ago I started to see some fillings fall out from both my right and left side but couldn’t go to a dentist because I had no insurance and no money. I have since gotten insurance (crappy as it is). About a month ago, a back molar (the one next to the wisdom tooth) on the upper left side broke (a piece of it about halfway across the tooth and down near the gum – there isn’t a hole that exposes the gum). I called a dentist closest to me (I don’t have a car and there aren’t many buses in my area so I’m limited with transportation) and made an appointment but they could only get me in on January 20. I was feeling fine, no pain or anything, so I thought it was OK. On Christmas day (2 days ago), the tooth right next to the broken one began to ache. It’s not excruciating pain and it mainly hurts when I bite down on it so it’s tolerable. I’m taking Advil (which is helping) as well as doing salt water rinses and apple cider vinegar rinses (which also help). I’m now trying to find another dentist that will take me earlier than the 20th, as the other dental office claims they don’t have an earlier appointment, as I don’t want to risk the pain getting worse, since it just started. Here’s the thing, though. About two months ago, I started getting some sinus pressure and pain on that side of my face. I suffer from chronic migraines so I thought it was related to that. It was like a dull (but persistent) ache around my left cheekbone and across the back near the ear and around the upper jawline (and sometimes the lower jawline also). I went to a doctor and he said I had allergies and gave me a prescription for a nasal spray (which didn’t help) and antibiotics (but I didn’t take them, as he said to only take them if I started to get a fever and feel really bad but that never happened). The sinus pressure/pain went away after about 3 weeks. But earlier this week it returned (though more sinus pressure than pain and more localized around the upper left hand side). It was a few days afterwards that the tooth pain started. I’m really praying that it’s not going to be a big issue and that it’s not an abscess. My gut feeling is that the broken tooth is going to have to be pulled (which I am terrified of) and that maybe the tooth pain I’m getting in the tooth next to it (which, as far as I can remember, is a healthy tooth – I really don’t know what is or is not health on that side anymore since I had all my dental work done 30 years ago) is really coming from the broken tooth, as they lay right next to one another (and there is what feels like a slight crack right on that side that borders the healthy tooth). Hopefully I can get an earlier appointment with another dentist and get this resolved before the new year! If they give you antibiotics always and I mean always make sure that you take them! It is extremely important, otherwise you could end up very ill and in the ER. Hope all is well. Will it go away on it’s own ? I had just gotten my wisdom teeth removed. All four were taken out and he said my bottom ones were very difficult, my the tops were normal. The bottom ones have no pain and have healed nicely. Unlike my top right one. I am now experiencing mucus draining from my top right hole, and I will randomly smell it in my nose. It has an awful rotting bitter taste and the smell is just as bad. Is this a sinus infection? What is my next step to healing this before it gets any worse? ENT Doctor? Or is this something my oral surgeon can fix? My dentist pulled my infected tooth because I wanted to make sure the infection was completely gone. I had a previous root canal that was infected for years because the dentist (different dentist) had left a piece of drill bit in my tooth and covered it up. I had no idea because he had deadened the roots and my ability to feel an infection. This caused an infection in other teeth and all over my mouth and gums. Anyway when the new dentist pulled this different infected tooth, he was a little angry because he wanted to do a root canal and so he left the infected root in my sinus cavity. Antibiotics do nothing for this infection and I can feel it. So because I am trying not to die, I was wondering what I should do and where should I go next. I’m pretty certaiin that i have a tooth that is causing a sinus infection. the tooth is an upper molar and had a large filling in it from childhood. I had a tooth ache and the dentist removed the filling and found the crack. Because of the crack the tooth needed to be crowned. they tested the nerve and he and the assistant had a debate over how little feeling i had in the tooth and whether a root canal was needed or not. they decided against the root canal and crowned the tooth. i started having pain in the tooth and the dentist xrayed it and said it was actually my sinuses and not my tooth. I went to the doctor and was treated for a sinus infection which seemed to clear up and the tooth pain went away. however, slowly my sinus infection returned. i am sure, that my tooth is cause but my dentist says no. my sinus’s are now causing me to have headaches at night and difficulty breathing. Can i make an appointment with an oral surgeon without being referred by my dentist? I have been dealing with all of these types of issues for quite some time. Nothing in the dental practice is “new” to us. I’m happy to field any questions that anyone else here would like to pose. Great topics, btw, I haven’t found a place so busy in such a non hostile environment without any trolling. Kudos to the admins. I feared i was going mad until i read these posts. I had a root canal on upper right back tooth and was fitted with a temporary crown. I took a 2 x 7hr flight within 4 days and felt what i thought was a cold coming on. 3 days later it became chronic running nose and then acute sinus pain. (Have only had sinus once in my life) The facial pain was gone after a course of antibiotics but the clicking noise and blocked feeling in right ear remained. I would suggest that you have the dentist do another x-ray to see if the root canal was successful. Most of the time they are, however from experience I know all to well. All of my upper teeth are now crowned, with the exception of one tooth and my 3 front teeth are a bridge. The bridge was done after I started getting tremendous pain in my teeth and a horrible taste in my mouth. I cracked the front tooth which was a crown at the time and after an x-ray it showed the root was dead. I know all about sinus issues it is sometimes from teeth that are infected. I could even be a different tooth. I have a major problem with my sinuses. When I have an episode my hole right side of my face hurts from my temple to my jaw all the way down my ear. I have really bad teeth but no way to pay fort then to be pulled and have been this way for quite some time. It’s there a way to get my teeth pulled without it costing a tun of money. I really need to get this fixed I can’t stand to eat a lot of food or the cold air it sends me into shock. Course of antibiotics. Tried a antihistamine. Could I be allergic to the glue or some reaction to the laser fast drying process? i got my wisdom tooth pulled out 3 years back ..the tooth didn’t come out as a piece ..it broke to pieces..one small piece was left there. it bothers me ..can this give me constant mild headaches, ear ringing and blockage in my ears? Please help me ..please..
i am getting these headaches for the past two months ..im going crazy ..tomorrow i have a dentist appointment ..please help me ..i can’t take this anymore .. Thanks, Very useful information. I am suffering from from Sinus problem since last 6 months.On basis of information provided by you I visited my dentist. Xray reveals that root canal of one of the upper gum was not proper and caused infection which lead to Sinus problem.I was thinking it is due to allergy. Hi, great to read these interesting posts. I have cleared started with experiencing sinus headaches on right side of head and face and then sensitivity in upper molar which has original filling from 30 plus years ago. Have used natural remedies to clear sinuses out and headaches went and now pain is isolated to lump in gum – directly above molar – sensitive to touch, which is causing ongoing sensitivity just under that tooth. Taking antibiotics. Is it possible to have the fluid drained ?? I just got back from dentist with same lump above molar on which I previously had root canal procedure done more than 7 years ago. Dentist said tooth is infected and I must return to endodontist. Said endodontist should be able to drain it from the side and will then fill the hole and give me antibiotics. No idea how much this will cost. I had to have four teeth pulled yesterday, and today I started getting a runny nose but notna sore throat (which I always get with a common cold). Do you think these could be associated? Or just coincidence? Something I should be worried about? Or will it go away on it’s own? Question…I have had pretty bad sinitius for about 2 years now. Ivery had tooth number 3 extracted a while back (before any of my sinus issues started)…now I need to get 14 extracted. Due to being directly under the sinus cavity, my dentist isn’t comfortable with the extraction and is sending me to an oral surgeon. Idk for sure if the tooth is what’s causing my sinus issues, but it wouldn’t surprise me….my concern is this: when 3 was extracted I remember being told to be careful about sneezing, coughing, anything really that could cause the sinus not to close back up right…this is also my current dentists concern. 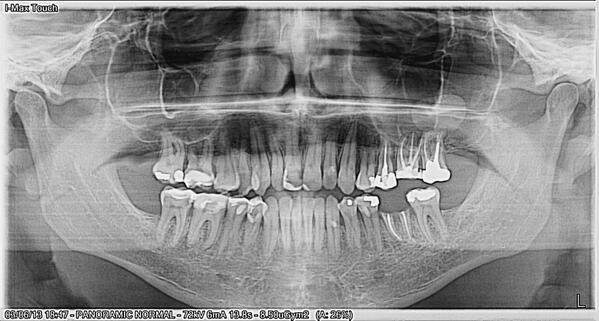 Back then it wasn’t a big deal, but now with all my sinus issues, this is a major worry point for me…if the tooth is causing the sinitius will it be better immediately after the tooth is pulled? Or could the sinus issues continue and cause problems during the healing of the extraction site?? I HAVE A BLOCKED NOSTRAL BUT WHEN I BRUSH MY TEETH IT OPENS UP. BUT WHEN I STOP BRUSHING MY TEETH MY NOSTRAL IS STUFFED UP AGAIN. DO YOU HAVE SUGGESTION ON A GOOD ORGANIC TOOTHPASTE? I USE EARTH PASTE CINNAMON, ALSO USE THIEVES ESSENTIAL OIL BLEND DENTAROME PLUS, TOM’S OF MANE FENNEL TOOTHPASTE, PLUS THEIR CHILDREN’S STRAWBERRY TOOTHPASTE. FOR MOUTH WASH I USE TOM’S OF MANE. I HAVE BEEN DIAGNOSED WITH PERADONIAL DISEASE. ARE THERE ANY THING I CAN EAT, DRINK TO GET RID OF IT? Had a root canal extracted dyed to numberous sinus infections that would clear up on antibotics constantly.for months and on Sep 18th2017 Had it extracted .Felt the entire extraction .Because of infection and tooth was rotted beneath the crown .Felt immediate relief yet I still have pockets of infection on right side of face and still on antibiotics.How longwill it take to clear up??? My dentist re xrayed it after extraction to make sure all the tooth was out .What more do I need to do . I have issues with an abscess tooth that I have been dealing with for months. Multiple root canals, finally got to the specialist and determined there was one canal that had been missed by my GP and he says I should be good to go. The problem is that my sinusitis went away shortly after the last root canal, but has now slowly started to flare up again to the point of being unbearable. My tooth hurts, but the tooth pain is not unbearable – more of a persistant hot throbbing . The specialist seems hesitant to proceed with further treatment. On my last visit he implied that he thought it was my sinuses causing my tooth to hurt however I feel strongly that it is the opposite. Is there any way, other than x-ray, to confirm whether it’s the tooth causing the sinusitis or vice versa?? Thanks for a great article. I just had an upper tooth #26 that developed an infection at the base of the 3 roots after a root canal performed in 2005. My new dentist was able to clean out the roots completely and redo the root canal with a lot of tedious work. (The bottom of the roots were not completely removed the first time. ) After the current procedure, my new dentist reviewed the pre-op cone xray with me, which showed an infection in the bottom of the sinus right above the tooth. I suspect this infection never cleared from the original root canal, since I’ve had chronic headaches, sinus infections, and intermittent fevers even after the first root canal. I guess periodic antibiotics kept it at bay over those years. Luckily tooth pain was the tip-off to the problem. Your article put everything into perspective. Thanks! my 3 year old hit me with a toy truck, and shoved one of my front teeth upwards towards my nose, and im wondering if this could be irritating my sinuses. ive had a nonstop sinus headache for 3 days. Thank you for this informative post. While I receive really good professional care from my doctors, often times it helps to understand the situation in order to communicate better. This is very intriguing to read! I have just been to the dentist for a root canal which was unable to be carried out due to the root being so infected. It smelt horrific and my dentist had to clean it out etc. Anyway I’ve had a problem in my sinuses and around the area for around two years now, doctors have given me 3 different strengths of steroids for post-nasal drip, I have swollen lymph nodes, swollen tonsils, a regular sore throat, yet I’ve not yet found a cure. I went in for blood tests yesterday to determine whether or not it’s anything more serious. I’m hoping the infection has been in my tooth this long that it has spread to other parts of my face and that it can be cured as soon as possible! At least the root canals been put back another month! Just to update you all, the blood test results were fine. I ended up going back he dentist to complete the root canal, however the tooth was still so infected that it had to be removed. A few days later I went and got some anti-biotics from my doctor. After 5 days of taking them, the infection had gone, and 7 weeks later I have not had any effects from my sinuses like I had for years previously. I can finally smell properly and feel like my life has gone back to normal without producing mucus every 10 minutes and having an infected face and nose. It definitely was the tooth infection that caused my long term sinus problem and it took over 2 years for the dentist and myself to pick up on it due to there hardly being any pain around the actual tooth. Very glad I went through the tooth extraction. Some one has had numerous teeth pulled over a two month period, and still complains of sinus issues Can you help with a remedy. I got my bottom wisdoms taken out a day ago. Immediatly after my surgery my nose started to drain with a untolerble sensation to sneeze everytime i breath And my eye is red, irritated and watery. Dr says it has nothing to do with my extraction but i have never had anything like this happen to me. I wasnt even coming down with anything prior to my dentist visit. What could be going on? I had the first portion of a root canal on an upper top tooth on Monday – four days ago. My sinuses began immediately draining and by Tuesday afternoon I had intense sinus pain and pressure. I’ve had an unending headache since. I returned to the dentist who switched my antibiotics. Is this a typical short term result of a root canal or should I be looking for a specialist now before the second part is done? I have had a crown come out twice. Now am told that I will probably need an implant. Was sent by dentist to Maciofacial surgeon to talk about the root. What she was more concerned about was a possible infection showing at top of tooth behind the one with crown. Have been sent for a blood test, and told to cease anti osteoporosis medication indefinitely. She talked about my sinus, how it is like a soft tennis ball and what can happen to it. She also said it can develop a hole, and if this happens, when I blow my nose it can come out of somewhere else, and more dreaded possibilities. I have been trying to find some information re sinus and the hole and implications. Can you help? Will this eventually take care of itself? I never had sinus issues in my life until an upper left molar died and was not extracted. The pain was intense when the tooth was dying, but now a chronic sinusitus exists. It has been almost 2 years. I had a root canal & cap but on my back tooth in Bali 4-5 years ago….recently I woke up with the tooth so painful that I literally couldn’t eat all weekend & straight away I got what I thought was a horrendous sinus infection….the smell & discharge from my nose is putrid & also drains down my throat. Went to the dentist, he put me on penicillin, a week later I was so sick I went to the doctor & have recently finished 2 courses of antibiotics (Moxiclav – Duo Forte – amoxicillin/clavulanic acid tablets)… Finished all these 4 days ago & while the antibiotics did help slightly, the ‘sinus’ issue is back as strong as ever, even though I’ve never had a sinus problem in my life! Long story short, I’m getting the tooth removed ASAP, sick of paying for so called ‘experts’ to not think the two problems are related & happily take my money, so I’m now telling my dentist what I want, it’s going! This is the worst thing to endure (well, maybe not the worst-worst, but you get it). Thanks for the info. I believe mine was brought on by seasonal fall allergies, but I had a major cavity in the lower bottom filled and that is the one that’s hurts like the dickens. I find that in addition to taking an allergy/sinus tablet et al., use a netty pot with distilled water and saline packets as often as needed to help clear out sinuses. Also, just rinsing your mouth the saline mixture and/or H2O2 hydrogen peroxide-based mouthwash adds relief, if but for 5-10 before you have to netty/rinse/repeat. Just riding it out. Thank you for this article. I recently had a back upper molar pulled 20 days ago. It had a root canal with a rod in it and a crown. It was abscessed. I had the blister like sore on my gums above that tooth. I have had subacute and chronic sinus infections for years. I feel like the medicine works and clears it up, but within weeks I could feel it coming back. After getting my tooth pulled, I was given 3 days of antibiotics. Again it started to feel better, but not for long. My face, ears, throat, jaw, neck and eyes were hurting so bad that I could barely stand the pain. This has to be one of the worst infections that I had had. I could feel the drainage from one side to the other when I rolled over in bed. I went to the doctor and was given Augmentin. After 2 days on med school, I am beginning to feel so much better. I have a feeling that the root canaled tooth with the rod was the cause of all my sinus infections. I, too, had a bad taste in my mouth for years. (I go to dentist every 6 mos and try to take good care of my teeth.) So I think this has been going on for a long time and I just didn’t realize it. I am so hoping that I am right and this will be my last sinus infection for a long time. So again I thank you for this article, Doctor. It has helped me tremendously! Can just a tooth filling lead to sinus complications? My daughter has been dealing with sinus issues for a year and a half. Now we r starting to wonder if it’s a filling that she got in June 2015— roughly the same time she started having sinus issues. She taken over 12 antibiotic and 5 steroids within the last year—but antibiotics don’t help. She is scheduled for her second sinus surgery later this month. Should she check with her family dentist to make sure it’s not her tooth– every ENT that we go to asks us if she has any dental issues. We never thought it would be her tooth—because it was just a filling, nothing like a root canal. Yes, I’d just check anyway. This isn’t the solution but it helps. I have one of the worst cases of what is being discussed here. I’ve had to resort to using Avamyst (for my nose and it helps my throat) which allows for drainage after helping with the inflammation caused by this hell. I also have to use Symbicort for my lungs otherwise I can’t breath properly as it’s inflamed from the constant drainage trying to get into my bronchial tubes. They are Nasal or Oral steroids for inflammation. They give me near instant relief and can stave of the next round of antibiotics. They are prescription medications here. It can stave of a bigger infection and help the symptoms until you can get it surgically fixed. iv had a sharp pain shooting into my nose every time I blow it. My dentist thinks its the root canal and he has prepared the tooth for a crown hoping the pain in my nose goes away. It has not. Before he works on it again would anti biotics clear it up ???? Im trying to get this sorted without too much cost as Christmas is only a month away…. I’ve had a root canal 4 months ago on tooth #2 then 2 weeks later I had ear pain, swollen nodes, swollen gums. I went back to the endo and he said everything looks good with the tooth but he found a cyst in my sinus right above my tooth. I went to the periodontist who cleared me of any gum disease bUT was worried about the cyst ,8 specialists later I went to the ENT and he stated that the cyst doesn’t have anything to do with this he wanted me to see a different endo. The new endo did a root canal on #2 &#3 he found a 4th canal on #2 but once he injected the sodium hypochloride it went up my nose down my throat. When I asked him he said it wasn’t toxic and I shouldn’t worry about it. I did some research and found out that maybe I have a hole in my sinus due to the root being inside my sinus. Today is day 4 and I have swellong discomfort the tooth is sensitive to pressure and I feel congested ear and head pain and sore throat. Will removing the tooth take care of the issue? I have never had such huge issues witg any of my teeth. Hi Jiji, if the sodium hypochlorite went down your throat, then I would say there is a communication between that tooth area and your sinus. Something doesn’t sound quite right as the sodium hypochlorite shouldn’t normally go outside of the root. I know you’ve been through a lot with this tooth, but it may be prudent to seek another opinion. Getting the tooth out will likely require some sort of surgery to fill in the hole between your mouth and sinus. I hope that helps! My dentist was pulling my upper left moler and slipped and one part of the root broke off and went into my sinus. He stopped working for a min called an oral surgeon friend cause he said he needed help and was advised to remove what was left of the tooth and then referred me to the surgeon to evaluate my condition and advise me. The dentist said sometimes they just watch it and do nothing if it doesn’t bother. He gave me antibiotics pain meds hydrocordone ibuprofen and Claritin. My appt with oral surgeon is in 4 more days and today the day after surgery I kept bleeding slightly out my nose. The moler was in bad shape to begin with. My concern is an infection and since the oral surgeon is quite friendly with my dentist I worry about being honestly advised. My dentist said he would pay for my visit and that they probably wouldn’t charge him much. My endodontist performed a root canal on tooth #2 last week – top right molar. I don’t have wisdom teeth. There was an infection that had been there for over a year -leading to sinus infections – confirmed by CBCT and CT scans. It has been a week since the root canal. How long should it take for the sinus inflammation to clear up after an infected tooth is treated? Just wondering if further treatment is needed by my ENT or if the root canal should take care of the problem over time. Are your symptoms cleared up? I too had a root canal on tooth #2 last week and I am wondering how you are doing. I’ve had post nasal drip/chronic sinus infections for a long time. ENT was discussing surgery, but I am hoping by having the root canal things will clear up. I am still have symptoms- better but still having chronic sinus infection issues. Going to have a repeat CBCT scan within the next month to check on the root canal. Have your symptoms cleared up? I have been having constant sinus infections on the left side and my upper teeth hurt so bad I can’t even bite down on them. After a couple of days of antibiotics they feel better for a couple of weeks before they start hurting again. I have gone to the dentist and they have taken a periapical xray and it shows the infected sinus but no infected tooth. My very back molar had a root canal on it in the 90’s and a crown on it for just over 10 years. I am tired of being on antibiotics once a month. I have seen the ear nose and throat specialist and found I have a deviated septum on left nostril, not bad enough to need surgery, and some mucus. He said to do a salt rinse twice a day and gave me a nasal spray to do once a day and next step is a CT scan. I am so tired of dealing with the pain and just want it to stop. Any suggestions? Left gums where I have been having problems. Saw dentist as thought may be abbess and she said my root on the tooth with a root canal looks like it may be fractured. I received confirmation this week that it is indeed a fractured root which is close to my sinuse and causing the problem. Unfortunately the tooth cannot be saved and has to be extracted. I am very upset by this but it has to be done. The specialist said my tooth had been fractured for a long time and I have also lost some bone due to the constant infections. Hi. I had a root canal last September. I’d had 2 courses of antibiotics before it for an abscess, but since having the root canal, I have continued to have discomfort. I’ve got quite a high pain threshold and have just been trying to ignore it, but am still not eating on that side of my mouth. Should have gone back to dentist I know, but I’ve just been hoping it would settle down, but it hasn’t. I’ve also been smelling phantom cigarette smoke for some time that has been becoming more frequent and when I googled that yesterday, I was quite startled to start making the connections. I think it’s very likely that I have quite a significant sinus infection. I also have the glands in my throat swollen on that side, an irritating cough that I’ve had since October and I often feel fatigued. My face is quite sensitive to the touch on that side, though not painful. I know the tooth with the root canal has a very long root that goes right up to the sinus – my dentist advised against an extraction because of it and that’s why I had the root canal. I’m going to see my dentist on Monday next week, but am wondering if anyone has any suggestions or advice of what I should do or ask for etc. Thanks in advance. Hi, I’m curious about your outcome. I went to dentist a month ago. Diagnosed me with an abcess, on a tooth that travels into sinus. Haven’t gotten it retreated or extracted yet but have funny dripping feeling on sinus, swelling feeling in sinus and head. No one has suggested I not get it removed because how close it is to sinus… can you tell me more about that? So the x-ray in this post shows a probably issue, yet the infection is not visible? If it was such a large infection as the surgeon noted, why is it not visible? I had an “invisible” infection that caused me great pain, sickness and stress. After getting a ct scan, we could finally see it and I got it sorted out. Yet here I am a few years later with a similar issue. No one will touch the tooth because on x-ray, it looks perfect! It’s been months and I am suffering daily (I can’t take motrin). Antibiotics for sphenoid sinusitis helped, but it’s but immediately after finishing the course. I had a root canal done in 2004, shortly after I had ongoing chronic sinusitis that was nearly fatal. I eventually had the root canal tooth pulled out and am happy with the gap left. The dentist said it was a healthy tooth that doesn’t need removing but when he pulled it out it crumbled and stank horribly. I still have the pieces of that tooth and it still stinks. It took a few years to get rid of the sinus infection completely and get my strength back. The dentist was evil and the doctors were useless. NEVER EVER GET ROOT CANAL DONE. I also got my 4 amalgam fillings removed and now I never drink soft drinks or eat rubbish foods. The whole reason I got tooth decay in the first place that needed fixing was from drinking coke. That horrific acidic poison should be banned off the face of the earth. I had six of my upper teeth extracted four years ago. I have been suffering with terrible sinuses. All ENT doctors told me I don’t have a sinus infection. Found another ENT doctor and through CT scans and the MRI she was able to notice that when I had my teeth extracted the oral surgeon left a live root in my #6 tooth and this was causing all my problems. So when you think you have a sinus infection think about your teeth this might help. I suffered for 5 months no one knew what I had. I’ve had chronic sinusitis for the last 18 months on and off which I put down to a mix of stress/anxiety/teaching 3/5 year olds and living in a very,very dusty town in Andalusia,Spain but I do have an unfinished root canal.A dentist started the operation in the UK about 2 years ago just before I left to live in Spain and then I couldn’t afford to get it finished off(to remove the infection) but now I can afford to get it done i’m scared but also very aware that it could be the real reason i’ve been so ill.I’ve been ill the last 7 weeks on and off with only a couple of weeks ok.I can literally feel it doing a circuit around my head,neck,sinuses,ear and glands all the time.This time I got a chest infection and now I can’t hear much out of my right ear.So,getting to the point I’m going to the Doctors tomorrow but would a Dentist see me if I’ve got inflamed sinuses? I’m just worried of getting ill again and not being able to see a Dentist and if I get antibiotics tomorrow it’ll be my 3rd lot in about 7 weeks which I really,seriously do not want but if I have to i’ll take them. I have a question. I’m scheduled to get three of my teeth pulled tomorrow by an oral surgeon and I’ve been taking antibiotics but I’m pretty sure I have a sinus infection can I still get my teeth pulled. Thank you so much for the article, the comments where excellent also. Almost two months ago my dentist informed me that I had to have 19 of my 25 remaining teeth extracted. This was the result of medical treatments, medication, and clinching and grinding my teeth when I was in pain. I was not really surprised that it had come to this because I knew my teeth were getting worse and worse. I did try to do something about my declining dental condition two years ago by seeing several different dentists. The dentists wanted to give me implants and do root canals, the estimates ranged from $17,000-$30,000 dollars. I had to retire early because of health issues and there was no way I could afford this. I thought if I just let them go, eventually some dentist would give me an affordable option. This finally happened at the beginning of July. The dentist told me I had six broken or fractured teeth, and 9 abscesses. Most of the other teeth (ten) could be saved by a root canal. When I told him I couldn’t afford that he agreed to extract all damaged teeth (my six bottom front teeth are in great shape because I don’t clinch at that spot and they are protected from the medication I am on by the salvitory glands). To my dentist’s credit he did not alarm me by saying I should have the teeth pulled ASAP, although he told me several times the abscesses could “go at any time”. I was originally scheduled to have them out at the end of August but I rescheduled to the end of September because the office where I was going was to far away and I can not tolerate too long of car rides (three herniated discs). One of the abscesses erupted last week. I have experienced a lot of pain in my life but this was unbelievable. My general dentist was furious when he found out I had rescheduled the extractions and at first wanted to have me hospitalized when my tooth erupted. He was able to get an emergency appointment with the oral surgeon that will be doing all my extractions. This article, and the comments, have helped me understand why I am having sinus issues now. I have experienced a runny nose nad horrible smells whenever I bend down. That didn’t start until five days after the extraction and three days after completing my Z-Pack. The drainage is becoming less nad the smell is getting fainter and fainter. I am hoping that the sinus issues where just a way for my body to get rid of all that swelling because of the “blown” abscess. 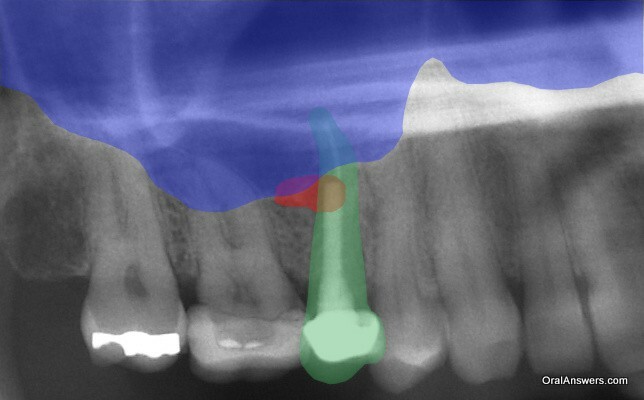 Is there anyway to prevent the other abscesses from erupting like tooth #5 did? The oral surgeon did not try to attempt to get me in sooner, so I am hoping that is a good sign. I would appreciate any input on the matter, just to have some peace of mind over the next 21 days. Thanks. I’ve been nursing an acute sinus infection the past 3 days. A few years ago I got my very first sinus infection ever. Now I get maybe one a year. In the past my sinus infections always made my back teeth hurt. Now my front teeth on the left side are throbbing. My face has swollen from lips to eye on that side of my face. I’m beginning to wonder if it is tooth related not sinus related. I look terrible and feel worse. My face is warm to the touch. I was told years ago that I had nerve damage to my front teeth from taking a fast ball to the face as a child. I was told eventually I’d need root canals but they couldn’t see any infection in the gap between the root and bone and If I did get an infection I might not feel it because the nerve was so damaged. So if this doesn’t get better in a day or two I’m not sure if I should see a dentist or Doctor? I’m beginning to feel better each day and the swelling has shrunk away from my eye but my top lip is so swollen. And I have extreme pain at the base of my nose. Thanks for writing this article, I have been trying to get a tooth fixed, and dentists keep x-raying the tooth, and saying there is no infection, when I’m sure there is, cause I keep getting sick again. So this time I’m going to demand they take the crown off, cause I’m sick of getting these major sinus infections, affecting my whole body. I am glad I read this article because I have been suffering from sinus infection for 4 years an went to a different allergy doctors because I live in San Antonio TX which is an area of almost every body suffer from allergies. I told all the different doctors that I don’t thin this is an allergy because is constant all year and allergies are seasonal I insisted that I may have a fungus or something else. but all of them treated like allergies. but recently I went to a dentist and they told me I have a infection on my upper back tooth and it happen that that molar had a root canal and have a big infection and they have to extract that molar and do an implant. I didn’t liked because I want to save my tooth but they told me not a possibility , but this place they specialized in implants. I went to a second dentist for second opinion. He say that He can re tread or re-do the rood canal but he said He didn’t warranty if will work. Of course they are not even talking about my sinus. they are just talking about dental work. They told me no connection with my sinus. I have my X-Rays here . How can I sent it to you and get an opinion. I think that this is exactly what it is costing me the sinus constant drainage to my mouth and my throat.